So you have a system in Amibroker that you backtested and you are happy with. You now want to go “into production”. How do you get your signals? How do you keep track of open orders, position sizes, ranking rules, etc. It’s not as easy as it may seem. If you try to run scans or explorations you will get Buy/Sell signals but how many? 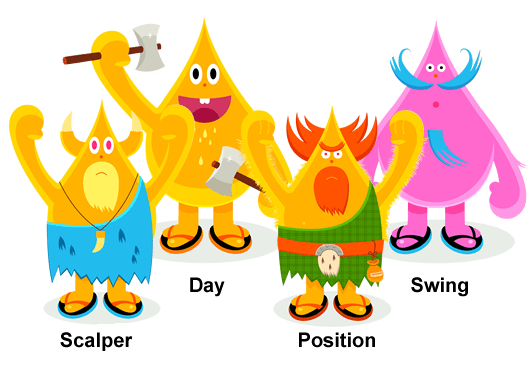 If you have 500 symbols and you trade the top 10 and your size varies with each stock’s ATR, you will have to rank the first 10 and compute, atr’s and position sizes and bla..bla..bla.. Do that day in day out… You will make a mistake. In every Backtested system there are assumptions. Position Sizing, Ranking rules, skipping signals or not, etc. One way to keep track of all those things is to let Amibroker do it for you. b You trade End Of Day at tommorow’s open or tommorow’s close. 1. Go to Amibroker and backtest your formula as usual. Check everything is ok, Commisions, Initial Equity, etc… Check that your backtested equity curve is what it should be. 3. In the Portfolio Tab, check the “Add artificial future bar” box. 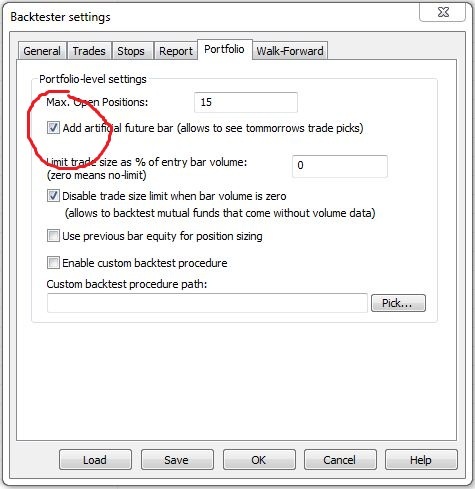 ** If you are trading ETF’s you might want to set “Limit trade size as % of entry bar volume” to 0. 4. Under Report select “Detailed Log”. 6. Check your margin if you are trading stocks. Max should be 50 (i.e.2x leverage) or higher if your broker allows for that. If you want no leverage set it to 100. 6a. Run the backtest. You should see a list. The last item should be for tommorow’s trade. Here you have the orders ready for you to follow. The Position sizing rules and ranking are done for you. All you have to do is synch to the system (the first time) and then follow it every day (or week or month depending on your system). 7. Save the .apx file that incorporates all your setting. While the Analysis Window is selected and you are happy with all the settings go to Amibroker menu, and select File—>Save As. A window will ask you where to save the file. Choose the folder where your AFL system formula is (or any other folder you want). Give it a name (My_System_1_Live) and save it as .apx, the default. Now you should have a My_System_1_Live.apx file that is all you need to backtest this strategy. b. Paste this code and save it not as txt but as .js. Replace the file locations with your own. Saving it as a “.js” make it an executable JScript under windows. 9. Double clicking on it will run run it. 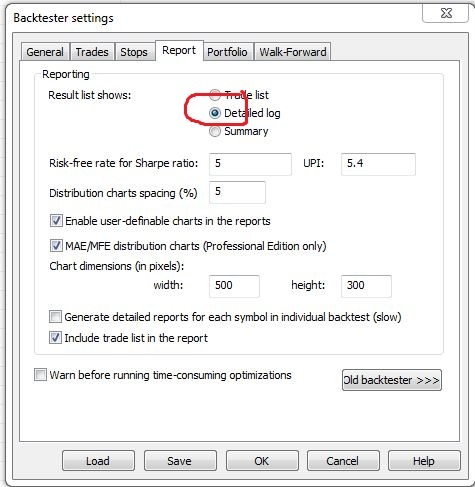 It will launch Amibroker, open the .apx file you specified, backtest your system and export a report at the location you also specify. 10. Open the .csv file. You should see the backtester’s results. The last lines should be tommorow’s trades. 11. (Oprional) Parse the .csv file. If you are good at jScript or VBscript you can write a script that will go to tommorow’s entries and parse them into arrays. You can then export clean csv’s or e-mail yourself the signals or drive a virtual system at Collective 2 or email your broker. Using the Custom Backtester Object. There’s many ways to do teh same thing. 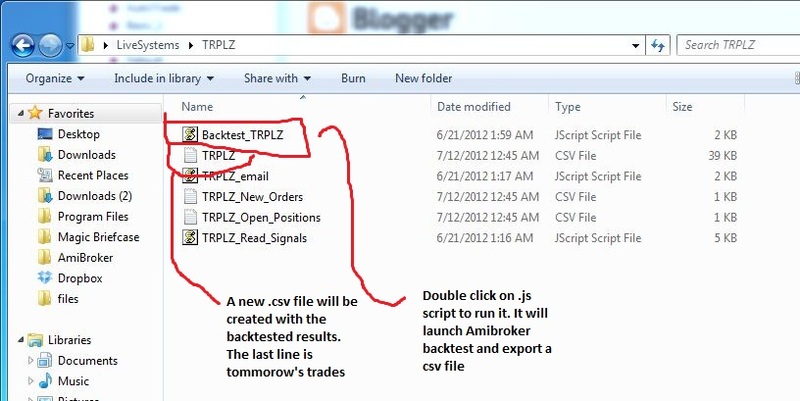 Here’s teh code for retrieving tommorow’s trades (and stops or other variables) using Amibroker’s Custom Backtester. StaticVarSet(Name()+”SL”,(stoploss));//place the stoploss inside a staticvar array. Include Name! Hi Sanz, I just came across your blog and read this article. It looks very promising. Could you please elaborate a little more on point point 11. how to send orders to say interactive brokers or collective2.